September was a tough month for me last year. I was going through a lot in my personal life…and as it usually does, this blog helped me muscle through it. I hosted the first annual Super Soup Challenge and I was blown away by the response. There were so many amazing entries…and stories behind the recipes. That event, in a time that was most trying for me, showed me that food (and blogging) can heal the soul and bring people together. As a way of remembering my mom, celebrating a wild and wonderful year, and – well – getting new soup recipes…I am hosting The Second Annual Super Soup Challenge! It’s happening a little earlier this year, which I hope will bring out some different types of recipes. It *is* still hot outside! Also, we have lots of people stopping by this blog that weren’t around last year and I encourage both old and new friends to join in. said it – don’t look at me like that), chowders – they all count. – Please be creative – send me your hot soups…cold soups….whatever! Last time around we had some really interesting recipes…and I anticipate the same thing this go’round! You will be judged on originality, yummyness, and presentation (i *am* a food stylist, after all). location, and the permalink to your post. I will post the roundup the week after the challenge ends. If you don’t have a blog but post to your LiveJournal or Myspace, you too can participate! – There is a prize at the end of this event. Two, actually. Since I was up at night fretting about who I should choose to win the challenge, I’ve decided to take some of the burden off of myself. I will choose one winner….and YOU will choose the other. Voting for the winner of the Super Soup Challenge will begin when I post the roundup – you’ll email me and let me know which post was your favorite! Two winners will receive foodie-friendly prizes. That’s it! I will be posting my recipe for the challenge next week. In the meantime, get cooking! The photo in this entry was taken by Tony Clark and styled by Tami Hardeman. What a great idea and sweet way to remember your mom. Food and especially a bowl of soup can be such a healing way to connect. I will have to think hard about which of my soups could actually be worthy of such a challenge. Thanks! I am looking forward to the challenge. Although, I’m not a “foodie”, I will put my best ladel forward in the effort. YAY! The round-up of the last event looks impressive. Really like soup, so I’m gonna compete in this one. 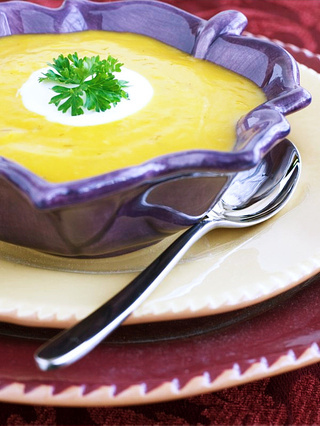 Honoring your mother with soup – terribly original and terribly sweet. After all, is there anything else int he world that can warm our souls quite as well? As the current reining soup champ I will do my best to get something made! Life is a little hectic but I will get my little brain a thinking. I too think of my momma when I make soup because it was one of her specialties. I have an unusual challenge as we are now in and RV and I have yet to tackle soup but I do want to participate in this challenge you have created. Love your blog. Lovely challenge to honor your mom. I look forward to participating! Tami, I understand your feeling. And I think you love your Mum more than you ever feel and perhaps more than she ever found out. I think she knows now. I’d definitely love to take part, as it is still chilly here in New Zealand. Cheers. I have a question. What if I did post the soup before on my blog. Can I still be participated? It looks like I just found your blog in the nick of time! This really is a sweet way to remember your mom. Nice going! Great challenge and i think choosing the winner will be a very tough job. I loved participating last year! I’m short on time this year, but I will really try to figure it out and make this happen before the deadline. This is just the sweetest food blog event, and I want to be a part of it. awesome idea! i am in! A lovely idea, I had my first soup of the autumn today and have just e-mailed you my entry. it’s coming up to one year for you now and i know it must be tough. this is a beautiful way to remember your mother and gives me pause to think of mine as well. it’s been just over six years for me and i’m not sure it gets any easier. I participated with an autumn soup…. Oh, I missed it! Shame. Looking forward to seeing the results. Wow, I just came across your blog and I instantly feel comforted. It’s been one month since my sister passed away and like you, cooking and writing my blog are helping me get through, so much more than I could have imagined. Thanks for making me feel better knowing I’m not the only one. May both of our loved ones rest in peace.